Whirlpool front load washer getting an error code? 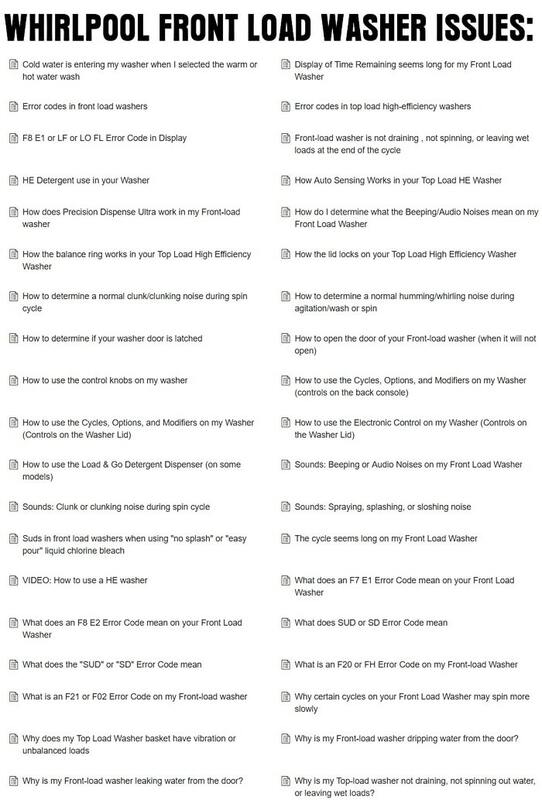 Here is a complete list of Whirlpool front load washing machine error codes. Find the code you are getting on your washer display and find what it is and HOW TO FIX IT! We will list parts that may be needed to repair your washer and have links that go to other pages to fix a particular issue. Remember, if you have questions or comments, please leave them below and we will assist you. NOTE: There are many different types of Whirlpool front load washers, be sure the error code is for your washer before replacing any parts. 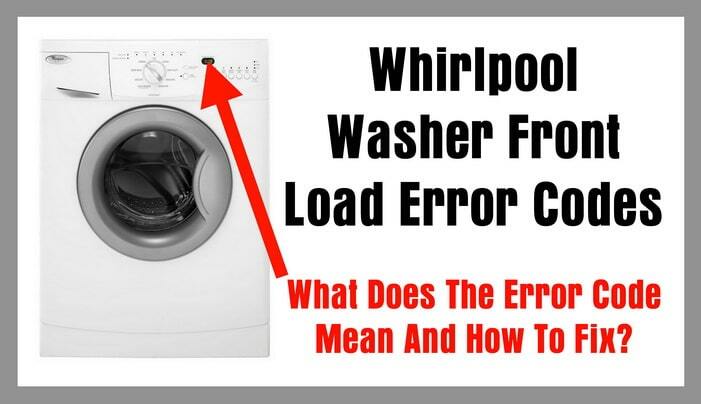 The error code list will have more Whirlpool front load washer error codes listed once they are available in our database. Important Whirlpool Front Load Washer Error Code Fast Fix: Press the PAUSE or CANCEL button twice and the POWER button once to clear an error code. What Does The Error Code Mean? = There excess suds in the washing machine. -The washer cannot spin out water with excess suds. -When “Sud” or “Sd” is displayed, the washer automatically extends the rinsing time to remove the excess suds issue. -The washer pauses the tumbling and adds water for additional rinsing to remove the SUDS. -The pausing lets the bubbles in the SUDS to break up and remove the error code. -The pause and rinse may happen several times to remove the suds. 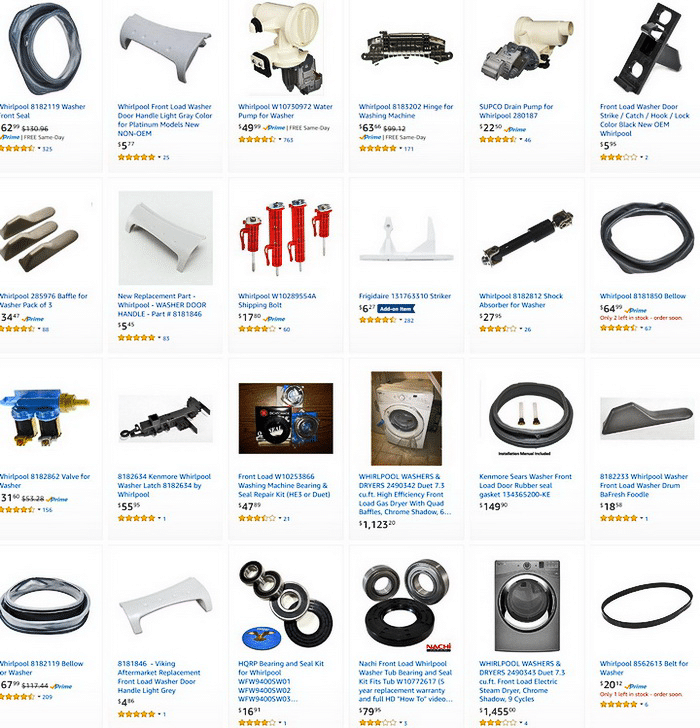 -NOTE: The Sud or Sd error code can also be a restricted drain hose or standpipe. -Make sure that the drain hose is not clogged. Drain Hose Clogged? What Does The Error Code Mean? = This code shows a motor speed sensing error. -The motor cannot get to the correct speed for the wash cycle selection. -Check that the shipping bolts have been removed from the washer in all areas. -Be sure the Whirlpool washer has not been overloaded with too much clothing. -Press the PAUSE or CANCEL button twice and the POWER button once to clear the code. What Does The Error Code Mean? = The washer door is not locking as designed. -Make sure no items blocking the door. 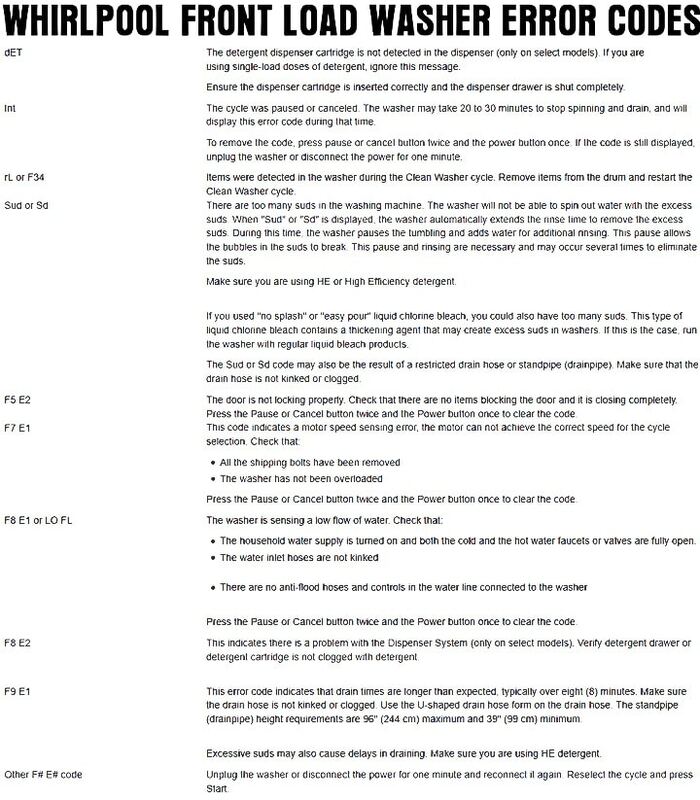 -Press the PAUSE or CANCEL button twice and the POWER button once to clear the F5 E2 error code. What Does The Error Code Mean? = The washer senses a low flowing of water. -Check that both the cold and the hot water valves are fully open to the washer. -Make sure the home water supply is turned on. -Check the 2 water inlet hoses behind the washer to be sure they are not bent or clogged. What Does The Error Code Mean? = This indicates there is a problem with the Cleaning Dispenser System. -Be sure the detergent drawer is not full of older caked on detergent. What Does The Error Code Mean? = This error code indicates that drain times are longer than expected. -Check that the drain hose is not clogged. -Excessive SUDS can also cause delays in draining. -Make sure you are using the correct HE detergent. -Unplug the washing machine for 5 minutes and reconnect it again to try and RESET the main board. What Does The Error Code Mean? = The detergent dispenser cartridge not detected in the dispenser. -Make sure the dispenser cartridge is inserted properly and the dispenser drawer is completely closed. What Does The Error Code Mean? = The cycle was paused or canceled. -The washer may take 20 to 30 minutes to stop spinning and draining. -The error code INT will display during this time. -Press PAUSE or CANCEL button twice and the POWER button once. -If the code is still showing then unplug the washer for 5 minutes. What Does The Error Code Mean? = Misc items were seen in the washer during the Clean Washer cycle. -Remove the items from the washer drum and restart the Clean Washer cycle. If you need help or have issues with your Whirlpool Front Load Washer, leave a question below and we can assist! We had the E1/F7 code flashing and tried to press pause/cancel twice and Power once, but now the Door Locked red light is flashing and the door remains locked. Any suggestions? My Whirlpool front loader washer will not raise all the detergent out. I do use the HE detergent in it. Previous post: TV Screen Is Black – Powers ON But No Picture – What To Check?